You know that moment where you overhear a loved one talking about something they really need, and realize you just stumbled onto the perfect thoughtful Christmas present? 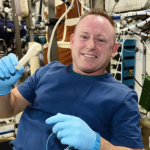 That’s what just happened on the ISS, where an astronaut recently opined about needing a wrench—and then received one over email and printed it out. We’ve heard a lot about the ISS’s new 3D printer, which was built and delivered by a California company called Made In Space. Though the printer spit out the first of many test objects back in November, those files were delivered to the ISS on board a cargo supply—not through wireless communication with Earth, as it eventually the goal with the printer. We had overheard ISS Commander Barry Wilmore (who goes by "Butch") mention over the radio that he needed one, so we designed one in CAD and sent it up to him faster than a rocket ever could have. This is the first time we’ve ever "emailed" hardware to space. Because it’s a lot faster to send digital data (which can travel at the speed of light) to space than it is to send physical objects (which involves waiting months to years for a rocket), it makes more sense to 3D-print things in space, when we can, instead of launching them.